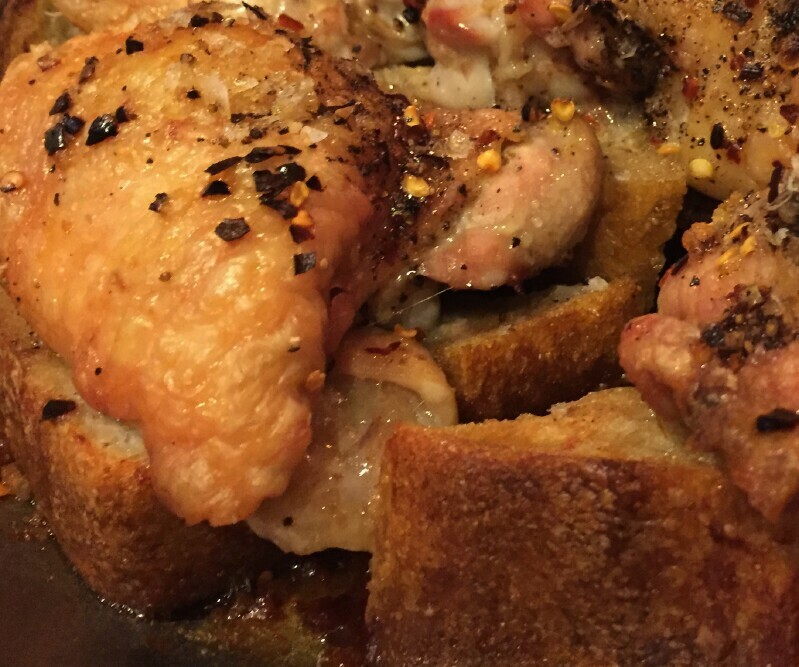 Zoomed by an Epicurious blurb for Chicken Bread a few weeks ago. Just as I closed the link it occurred to me that it sounded really good. 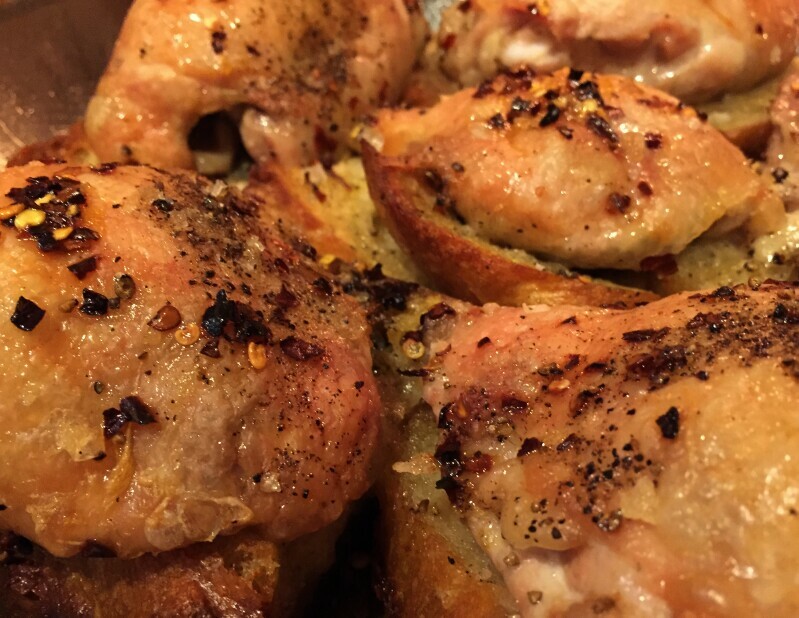 Roast a chicken on top of bread, end up with crispy chicken fat soaked bread for munching, to use as croutons in salad or as a decadent base for a topping. The idea of roasting chicken on stuff is not new, root veg being common, even over/along side potato, I still remember my first taste of the delicious potatoes at Schwartz's in Montreal roasted underneath spinning chickens on my honeymoon, but high heat over bread, thick sliced sourdough in this case, was a new one on me. Epicurious called for a whole chicken, I used thighs with a heavy dose of salt/pepper and sprinkle of crushed red. I can write up a recipe if someone really needs the belt/suspenders approach, but the basics are a low sided ovenproof cooking vessel that does not cramp the chicken and bread, but is not so large as to let juice/fat escape without being soaked into the bread. 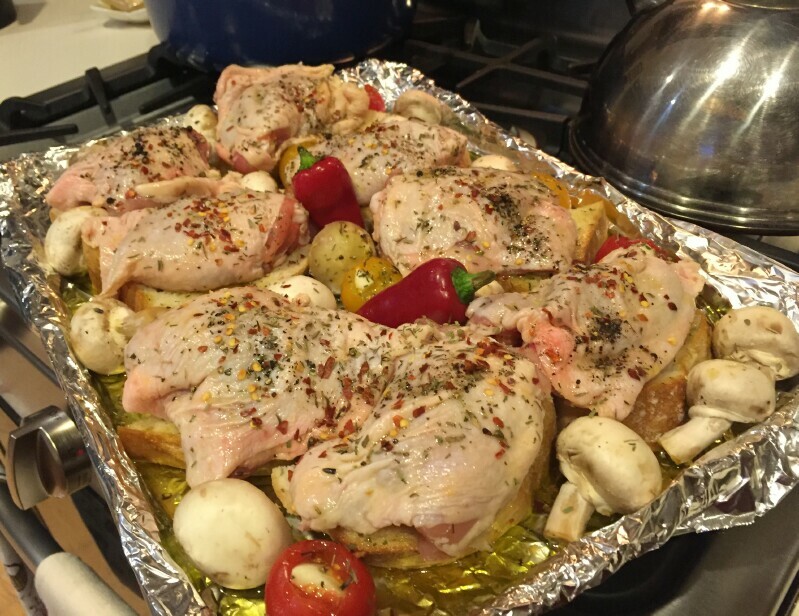 Lightly coat the bottom of the pan with olive oil, layer thick sliced bread, I used sourdough, top with chicken thighs S/P/crushed red, bake at 425 until skin is crisp and the chicken thighs are 165 internal. Chicken Bread worked perfectly, was simple, delicious and is something I will do again and again. This was truly fantastic with the crisp chicken fat/juice bread the star. Next day I made a salad with the chicken, romaine, radish, olives, torn chicken bread as croutons and a very garlicky dressing. Was so good I had another a few hours later. That sounds like a great idea. 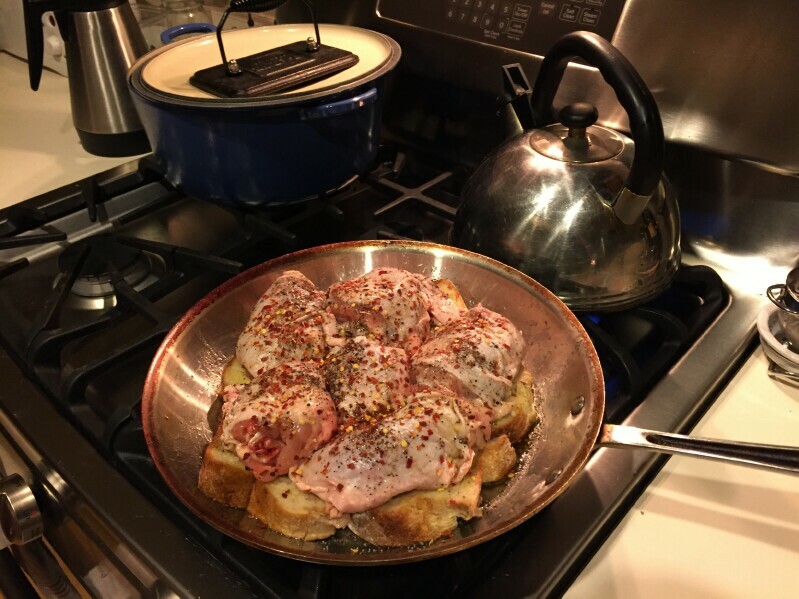 Did you use that bacon press in your picture on top of the chicken? stevez wrote: That sounds like a great idea. Did you use that bacon press in your picture on top of the chicken? No, that's just where that bacon press lives, was not put into play for the chicken. I should be clear, not for Steve, but if anyone is wondering, the chicken bread was not cooked stove top, it was baked in the oven. Last edited by Pie-love on October 28th, 2015, 10:31 am, edited 1 time in total. The same technique works for tomatoes and cheese--olive oil, tomato juices and the cheese sub for the chicken fat but the crust that forms with the roasted tomatoes on top are definitely a heavenly slab of goodness. I may have to make this tonight! boudreaulicious wrote: The same technique works for tomatoes and cheese--olive oil, tomato juices and the cheese sub for the chicken fat but the crust that forms with the roasted tomatoes on top are definitely a heavenly slab of goodness. I may have to make this tonight! Sold. This is going into rotation. Just read the linked recipe and it differs in a number of ways. With "Chicken Bread" the bread is the solo starch and there's no veg. The Greenspan recipe uses less bread, additional liquid and a dutch oven which would affect crisp. Its a tasty sounding recipe but with "Chicken Bread" the bread, at least to me, is the star of the show in Dorrie Greenspan's its more about the chicken. G Wiv wrote: Chicken Bread worked perfectly, was simple, delicious and is something I will do again and again. Second verse, same as the first. Unless one is a total hermit Chicken Bread should be on your short list. 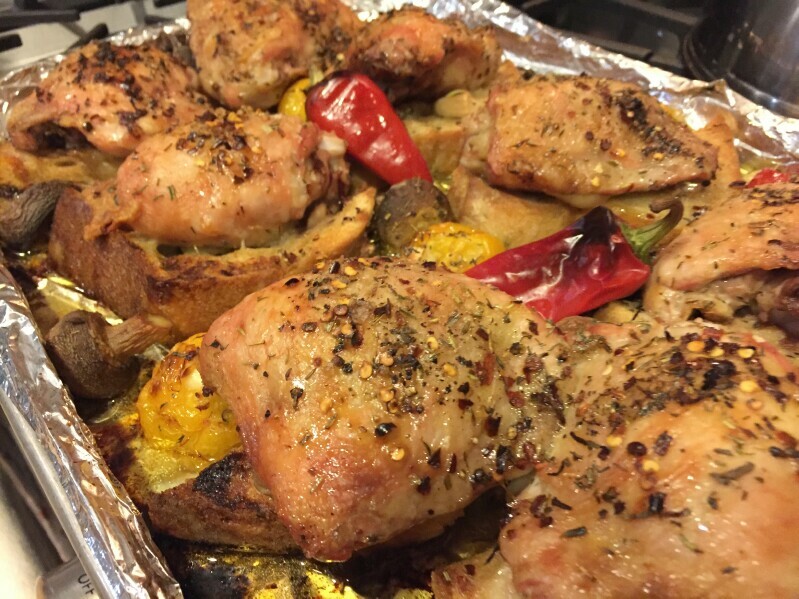 Hi GWiv- Thanks so much for posting your recipe. I followed your directions, but used some leftover garlic bread in place of the sourdough. It was delicious. The bottom of the bread developed a really delicious crunch while the inside stayed moist. My middle son felt it was soggy, but to me, it was akin to bread pudding texture. What a genius way to use up bread. My father was ahead of the curve on this one. I woke up daily to the smell of rye bread toasting which he then rubbed with garlic and smeared with schmaltz. A trendsetter. buttercream wrote: Hi GWiv- Thanks so much for posting your recipe. I followed your directions, but used some leftover garlic bread in place of the sourdough. It was delicious. The bottom of the bread developed a really delicious crunch while the inside stayed moist. My middle son felt it was soggy, but to me, it was akin to bread pudding texture. What a genius way to use up bread. Good idea on the garlic bread! Chicken fat and juice infused bread pudding, whats not to like I enjoy contrasting texture, outside crunchy, bottom caramelized toasty brown crisp, inside soft yielding impregnated with chicken juice and fat. Chicken Bread hits me right in the sweet spot. spinynorman99 wrote: I woke up daily to the smell of rye bread toasting which he then rubbed with garlic and smeared with schmaltz. My great grandfather owned a Jewish bakery in Milwaukee and his and my grandfathers favorite quick nosh was still warm seeded rye slathered with schmaltz and a thick slice of onion. A rub of garlic sounds a tasty addition. Last edited by Pie-love on October 28th, 2015, 10:32 am, edited 1 time in total. I made chicken bread last night. 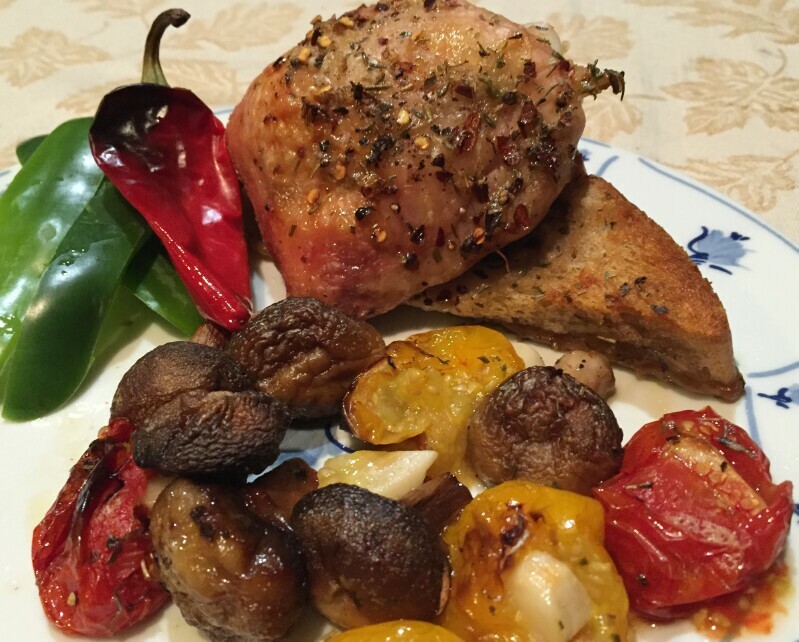 I deviated slightly from G Wiv's dead simple recipe by using a whole chicken that I cut up (The Chow Poodle likes chicken breast) and seasoned with my own mix of salt, pepper, garlic, dried lemon peel and herbs de Provence. It was everything you'd imagine; crispy, schmaltzy and sinfully delicious. Although I enjoyed every bite, it's probably not something I will be able to eat all that often due to the major amount of chicken fat that gets imbued into the bread. I will say that the next time I need my oil changed, it's chicken bread for me! I tried this quick and simple recipe. I had a quarter of a French bread loaf that was a few days old. 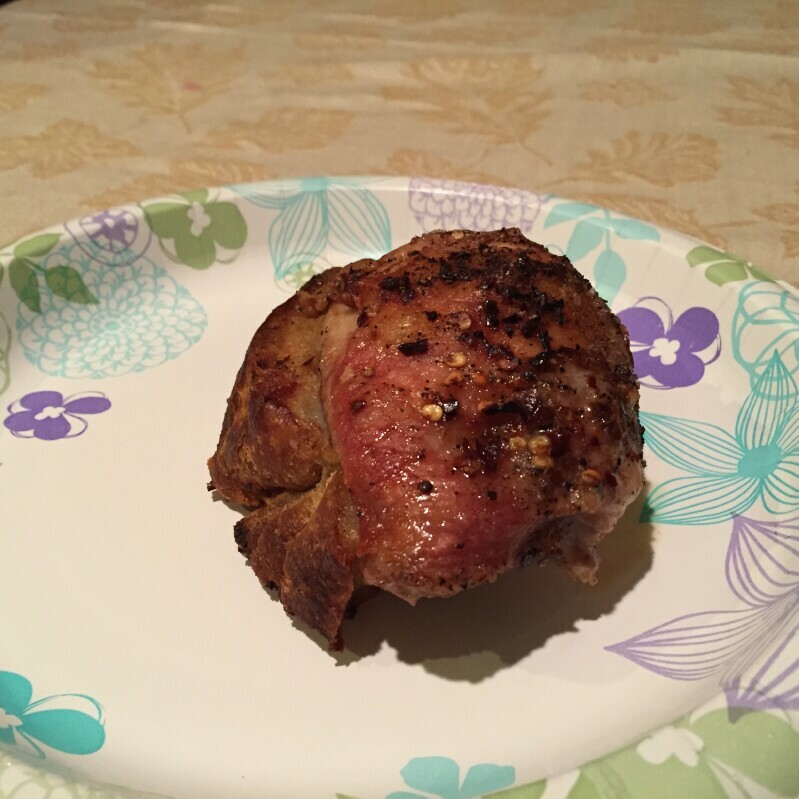 I cut into thick slices and put chicken thighs on top. a little butter, salt, pepper and pepper flakes and it was WONDERFUL! I felt so good using up old bread. I felt like the texture was move like stuffing especially when reheated the next day for lunch. Thank you for the idea! So good that SO, who had requested and ate a pretty substantial grilled cheese and tomato soup, went back for 2nds of Chicken Bread! It lived up to the hype. This is definitely a keeper. OK, I tried it but had a minor fail. First, I used only one thigh--it was only me eating. Then, I cooked it in a one-quart Tramontina saucepan, maybe the sides were too high. Thirdly, I cut a baguette length-wise in half. That turned out to be a big mistake--I really, really should have cut the crust off: it got hard as a rock, and didn't absorb much rendered fat. Finally, the chicken skin didn't crisp well, only half was browned and the other side was limp. How could I screw up something so simple? Sheesh. But the several bread-regions that worked were quite tasty. Obviously, I'll have to try again. Geo wrote: How could I screw up something so simple? Sheesh. Sides were too high, please note use of a oven proof saute pan. Bread to chicken ratio was off, not enough fat/juice to properly infuse all that bread. One thigh, seriously? You on a diet? Hope you try Chicken Bread again, its really quite delicious. On a diet? Gary it's *Geo* you're talking to! Seriously! And for sure I'll try it again--I got enough excellent tastes to attract me again. I've got a proper pan for 3-4 thighs. Tnx for the encouragement, Gary! Just to add some detail, I used a baguette (a pretty wide one) cut into about 1/2-3/4 inch thick rounds and I definitely didn't need to cut the crusts off--they got crispy but not hard--and the interior was perfectly custardy in the middle but still slightly toasty on the bottom. I used a pyrex and had no issues with the sides. Skin was uniformly crispy and bread was fine. I did oil the bottom of the dish and squirted a bit around the sides of the bread once everything was laid in. Not sure the chicken fat would've been enough to get the bread the right texture in the pyrex so the pan would likely be better. And have to agree on the amount--I think you'd want at least 2 thighs and, ideally, they should hang over the bread but not touch each other to get all the textures right. The recipe from Epicurious linked above in Gary's original post calls for sourdough sliced and drizzled with oil and sprinkled with salt. 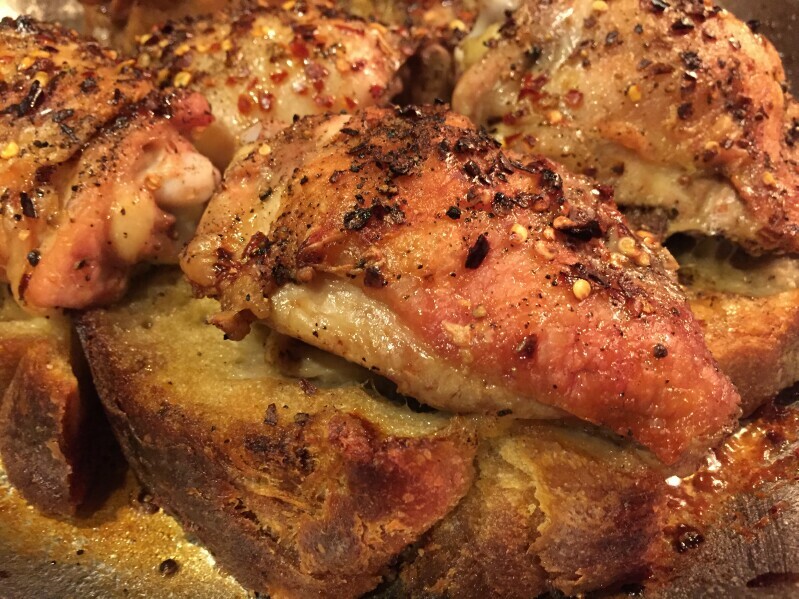 Once you have the chicken prepped, be it whole or thighs, place it directly on top of the bread and roast away. You're making it way more difficult than it is. Not sure who "you" is but didn't have the recipe and did exactly that. Sorry if the description was overkill. What is it about this thread???? boudreaulicious wrote: Not sure who "you" is but didn't have the recipe and did exactly that. Sorry if the description was overkill. What is it about this thread???? boudreaulicious wrote: What is it about this thread???? I vote for a jello wrestling match to figure it out. Red beans and rice may be Monday tradition in New Orleans but in the G Wiv household Monday means Chicken Bread! I've done this twice now - very tasty. All of this is making my mouth water. Looks like a recipe we will be trying soon ~ Might be in for baking a loaf of sour dough bread first though. Exactly my thought, so I made it for the first time. The Epicurious recipe calls for a whole chicken which I did. I think next time I will try parts. With a whole chicken, there was not enough bread that didn't burn. The parts would spread out more and cover more bread. lougord99 wrote: Exactly my thought, so I made it for the first time. The Epicurious recipe calls for a whole chicken which I did. I think next time I will try parts. With a whole chicken, there was not enough bread that didn't burn. The parts would spread out more and cover more bread. That was my experience, too ... the bread that wasn't covered by the whole bird burned a bit (but still edible). For Thursday, I'm thinking of spatchcocking my heritage turkey and cooking it over slightly stale bread. Turkey bread, anyone? nr706 wrote: For Thursday, I'm thinking of spatchcocking my heritage turkey and cooking it over slightly stale bread. Turkey bread, anyone? Leave it to nr706 to take it up a notch!! lougord99 wrote: With a whole chicken, there was not enough bread that didn't burn. The parts would spread out more and cover more bread. I have not done Chicken Bread with a whole intact chicken but if I did a whole chicken it would be spatchcocked to cover more surface area. I have not had burned bread in a number of Chicken Bread outings, but have only used bone-in skin-on thighs one per thick sliced triangle of sour dough. My temp is 425 and Chicken Bread is done surprisingly fast, I check for 165 internal with my Thermapen at the 40-minute mark and its typically done. I rotate the pan half way though and probably use more olive oil than most.